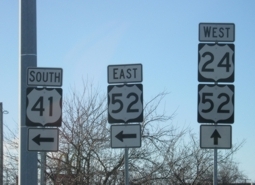 U.S. Hwy & State Route Signs From Street Sign USA! U.S. Highway & State routes are the most popularized roads in the nation. Take Route 66 for instance. Colored black on a white background, you can purchase for actual road use or for decoration, memorabilia, etc.